The Food Stamp Program started in the late 1930s in response to an unprecedented situation where the U.S. had both farm surpluses and hundreds of thousands of hungry people. In the early version of the program, people purchased stamps on a $1 for $1 ratio, but also received additional stamps that entitled them to buy foods that were designated “surplus” at local stores for a reduced price. The program lasted until 1943, when the escalation of World War II resulted in both decreased surpluses and reduced unemployment. In 1961, the Food Stamp Program was reestablished as a pilot program and incorporated as part of Lyndon Johnson’s War on Poverty to assist the thousands of Americans who were still under-nourished. The Food Stamp Act of 1964 launched it as a permanent program, but it was not until 10 years later, in 1974 that the Food Stamp Program went nationwide and Congress required participation from all states. 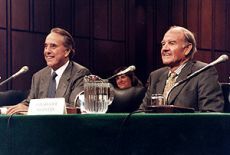 Bob Dole had been peripherally involved with the program throughout his House of Representatives and early Senate career, but in 1977 he led the charge to change the Food Stamp program significantly. Along with George McGovern (D-SD), he worked to produce a bipartisan solution to two of the main problems associated with food stamps: cumbersome purchase requirements and lax eligibility standards. They succeeded in designing a program that eliminated the need for individuals to make a required minimum payment to obtain food stamp coupons – a minimum that many still could not afford. Dole’s involvement didn’t end there, though. In 1991, when a deadly tornado ripped through Southeast Kansas, he pushed for and got emergency food stamp assistance for residents in those counties in record time – just four days. Just two years later, when severe flooding occurred in the Midwest, he did the same for its residents. This only solidified Dole’s record as a strong yet pragmatic supporter of food stamps and the difference that they can make in the lives of Americans. To see additional digital materials related to Food Stamps, visit our History Day topic page.